Cheap Accommodation Dublin - How to Pay Less for Your Dublin stay. There are many opportunities to reduce the cost of your accommodation in Dublin, or indeed in most other cities in Ireland and throughout the world. Here are our top tips for making considerable savings if you are looking for some cheap accommodation Dublin canprovide. Book your accommodation well in advance (Plan ahead). Try to stay midweek if possible. Book more than one day at a time. 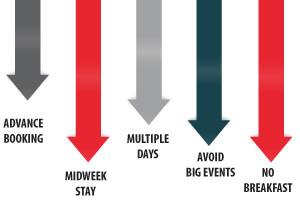 Avoid times when there is a big event at the location. Avoid locations where a big event is taking place. Find a good Hostel which is the really cheap accommodation Dublin can provide. Book in advance can save you lots! Saved €60.00 by booking a month in advance. So it is worth planning ahead. Saved €170.00 by staying midweek. It is very rare to find savings or discounts for one night stays. There are many substantial discounts for staying at least two day with quite significant savings for longer stays. Today we found up to 61% savings for longer stay bookings. Avoid Big Events unless you are attending yourself. During times of big events like All Ireland GAA Finals, big rugby matches, popular concerts at Croke Park or The Aviva or The Dublin Horse Show, put off your trip unless you are attending yourself. There is huge demand for accommodation during these times and hotel prices tent to be considerably higher and there are rarely any deals or discounts available. If you are attending or if you have other business in the city at those times consider looking for accommodation on the other side of the city far away from the event. You may be lucky to find reasonably priced accommpodation there. Some destinations are very popular during the ‘high season’. This usually applies to places which are weather dependant like seaside destinations. Most places are more popular during the Summer months when people are on vacation from work or school. Although Dublin does not experience huge seasonal fluctuations in visitor numbers, it is the case that about 45% of visitors come in the four months June to September. Consequently, there is greater demand for accommodation during these months and prices tend to be somewhat higher. Christmas and Easter are othe busy times. This is a matter of personal choice. If you like a big hearty breakfast like the Full Irish Breakfast then go ahead and include breakfast in your booking. But many of the hotels you will see when you perform a ‘Search for Hotels’ will have options for booking rooms with or without breakfast. The included price can vary from about €10 to €20 per person per night so that if you opt for no breakfast you can save up to €80.00 for two people for two nights. We find that there are many people who have no breakfast or perhaps grab a quick coffee and snack. There are usually numerous restaurants and cafes nearby where you can get a much cheaper breakfast to suit your needs.For people like these, there are considerable savings to be made. This is a ‘no-brainer’! There are lots of deals to be found on all grades of hotels from 2 star to 5 star. Use the ‘Search for Hotels’ on the right of this page for your chosen dates. Scroll down the list and find the best prices. Sometimes you can find a better quality hotel with discounts which will make it cheaper than a lesser hotel. If your dates are flexible, try other dates. Don’t just accept the first hotel that appears. There are great deals here! Update 4th July 2017: Booking in advance for Wednesday & Thursday 18th & 19th October 2017 shows numerous discounts up to 56%.